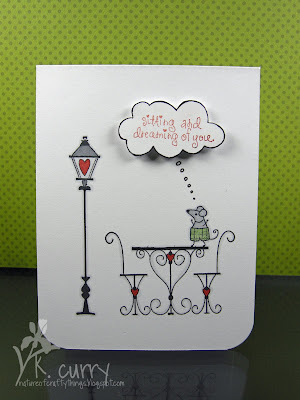 **Sweet Sunday Sketch/Etsy Inspired challenge card is the 2nd in the post! We all know I can't pass up a challenge, especially a one layer one! Lateblossom is continuing her Wednesday challenge, this week with a little twist, flock or glitter. The feet are Hero Arts and stamped with the essential glu pad, then blue flock added. I have loved the look of a glitter frame, so I used 1/4" scor tape to make a frame. I mean why not include both! With the sentiment (also Hero Arts) it seemed much like a Hollywood footprint of the stars. And what baby doesn't deserve to feel that way!! My second card was made for a couple of challenges combined. Another for the Etsy Inspired Challenge and for Sweet Sunday Sketch. 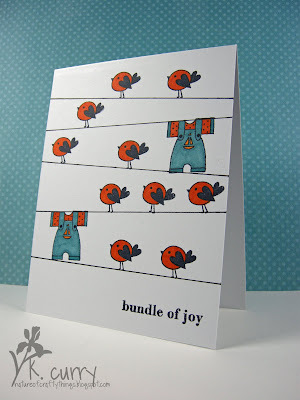 I was able to use some scraps to make this card inspired by this screen print by beethings. They have some really cool stuff! I really like this colour combo, really I like anything paired with grey! Hope everyone has a great weekend, thanks for stopping by! **the Moxie Fab 3 cheers for chairs pic is at the bottom of this post! Wow! 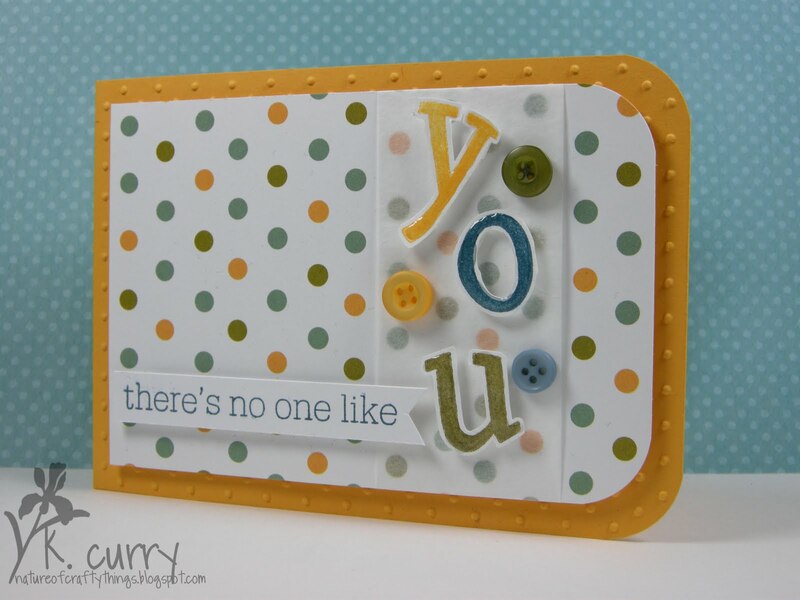 The Papertrey Blog Hop is so much fun! So many wonderful ideas and fatastic cards. Thank you to everyone who said such nice things about my card. On to a card! 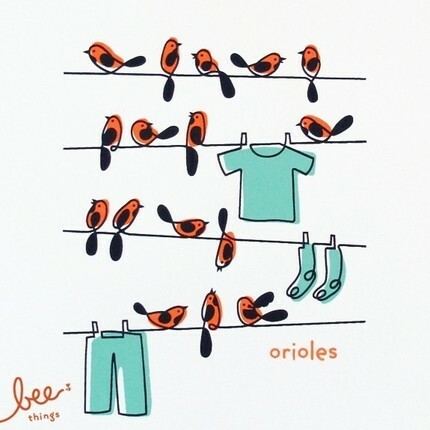 The current CARDS blog challenge is to submit your favourite card ever. I thought, how am I going to figure that out? But actually it came to me pretty quickly! The one I chose is my favourite for so many reasons, mostly beacause it features my dog Dakota, who has since passed on. She was originally my mom's dog and I ended up "inheriting" her. I made this card for her old vet, once she (Dakota) got settled in her new home across the country. I had to modify three of the Unity stamps I used. The lampost wasn't tall enough so I inked the top, stamped it then inked the bottom and stamped it. Then with a ruler I drew in the middle part of the post. The other stamp was the table & chairs, but the table had a teapot and 2 teacups on it. I didn't want that for this card so I placed a piece of a post-it over the part I didn't want and inked up the rest of the stamp. It worked, mostly, OK. Then finally, the saying was attached to a stamp of a bird, so I just stamped and cut it out so I could pop it up like a "real" thought bubble! The mouse is from the Hero Arts elephants sets. I LOVE his plaid shorts! Well thanks for looking, I am off to do a couple more challenges before I have no time. I must work this weekend. Have a great day! 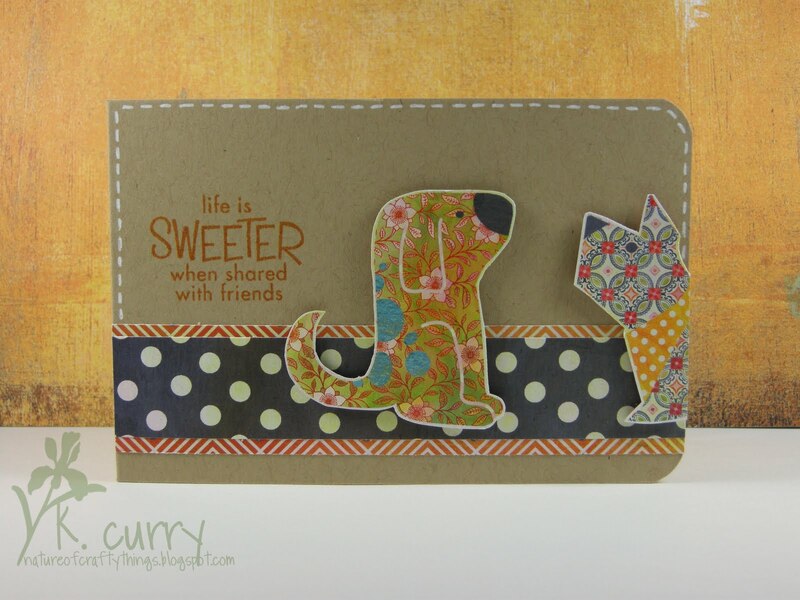 first ever Papertrey Ink blog hop! This is my first ever Papertrey blog hop! I am so excited! The challenge was to use tissue paper. There are so many ways you could use it, I chose a very simple way to use it. I used it over top of the Polka Dot Parade paper to lighten or take some emphasis away from, the brightness of the dots so I could put my letters there. I think it allows the letters and the buttons to stand out and not have the dots pull your eye away. I used a little bit of diamond glaze on the letters to make them puff up a little bit. 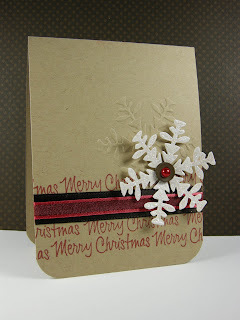 And then also used the swiss dots embossing folder to add a little more to my card base. I have learned that if I am not doing a one layer card I have trouble leaving the base flat! I wish I could have used some new supplies but i was way too slow ordering and everything I wanted was sold out! Better luck next time I guess! Thanks so much for looking, and enjoy the Blog Hop! paper: summer sunrise cardstock, polka dot parade pp. 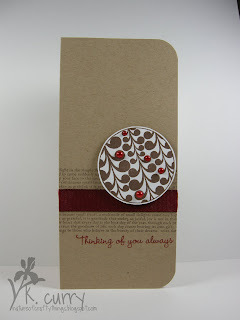 other: vintage spring mix buttons, swiss dots embossing folder, diamond glaze. I am having waaaaaaay too much fun making these one layer cards! I am adding this to Kristina Werner's challenge but mainly this was made for the Etsy Inspired Challenge. There are so many amazing things in Etsy, something for everyone I think. The challenge was to be inspired by an item from the "beethings" store. I found the above screen print and was originally inspired by the colours, but lately I have been needing baby cards and in my Hero Arts collection I found this little overalls stamp. I just had to use it! So I guess really I ended up CASEing the entire thing! Thanks for looking! Have a fantastic weekend. I was wowed by the colour combo from this week's Tuesday Trigger and wanted to attempt to use it. I'm not the greatest with colour combos because I usually start out using the right colours, but then don't like the way something looks and I eventually end up with a card using none of the required colours! I also used this week's FTL#86. It worked out well because I have a lot of coloured card bases from leftover cardstock, but often turn to white or kraft. And I often find when I try to use another colour cardbase I feel the need to emboss it or something to give it a little something more. The circle stamps are Hero Arts circle designs and the sentiment is from their card messages set. So here's the last one for tonight! 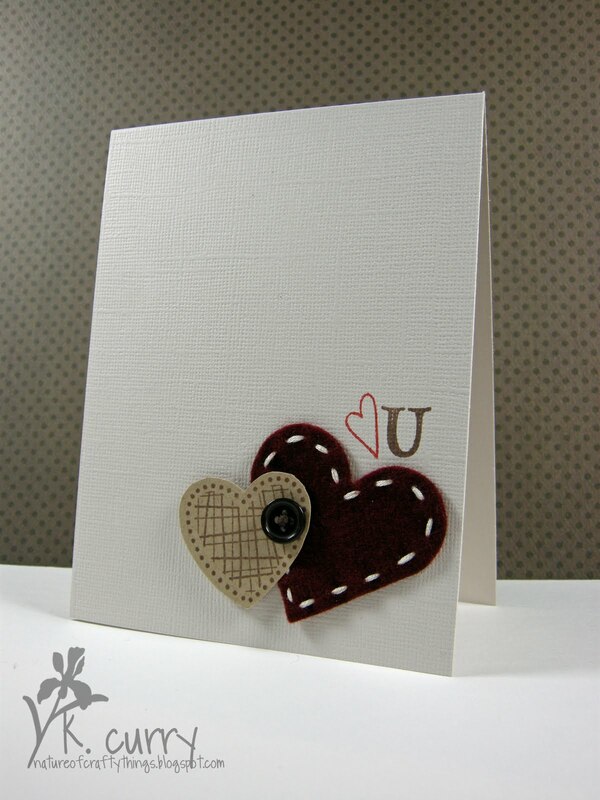 I made this one using the die cut heart from my previous card as a mask to create the white space. ...and apparently I can't get enough of the red felt & button combo! The stamps are Hero Arts woodgrain and PTI's simple alphabet. I had trouble with where to put the sentment on this one too. Oh well! Thanks for stopping by, have a great night! all about the one layer card! I have recently come to realize that I am in LOVE with the one layer card. I find myself dreaming up all the different ways to make one. 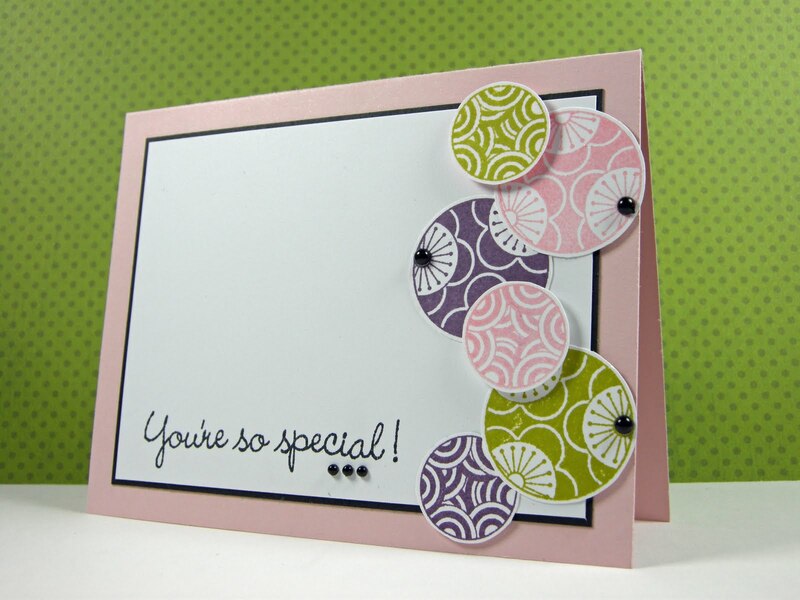 It also seems to be a common theme in the cardmaking world right now. 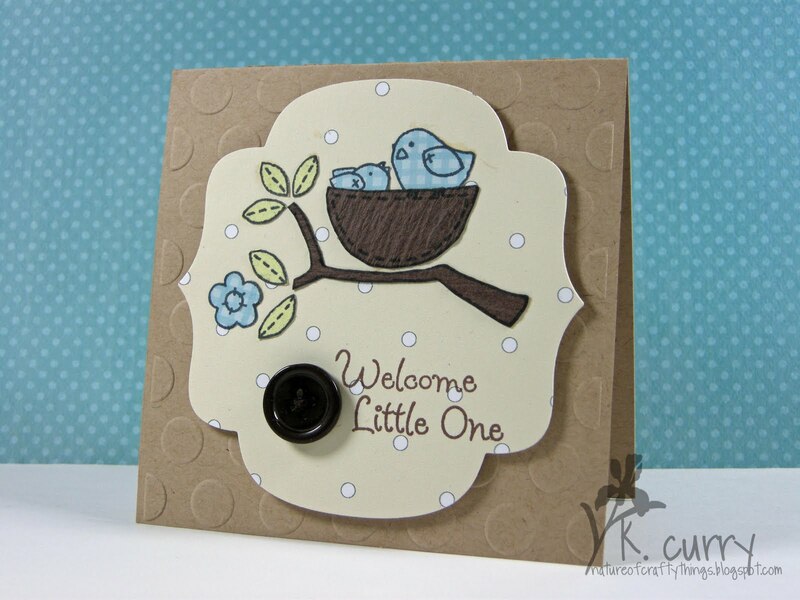 Kristina Werner has put out a challenge to create a one layer card. Since I couldn't stop I have a couple to show you! First up is a very simple one using a stamp I have been itching to try out. I think this peacock was screaming to be "copic"ed (bad word creation!). I really like the look of copics on kraft cardstock. The peacock stamp is from Unity and the sentiment Hero Arts. Copics used were R32, R35 & R37. For my second card, I first created this on kraft then thought maybe it would look better brighter, so i created it on white as well. I still can't decide which I like better. For this card I punched out a heart from Nestabilities, and used the negative to mask off the card base. 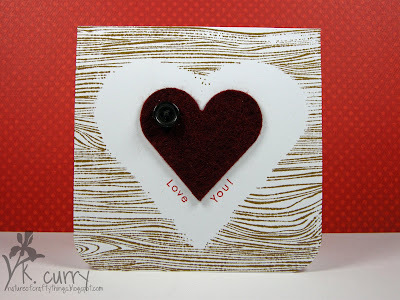 Then I stamped the Hero Arts woodgrain background stamp. I wanted to place a sentiment but straight across the top or bottom just didn't look right so I attempted to round it around the heart. Happy Friday! I decided since I was ahead of myself with my MIL mother's day card, and the 2 weddings I have are 5 weeks away, I would keep up being ahead! For those that know me I'm usually a night before or day of kinda girl! This is for wedding number 2 this summer, their colours are blue & brown, and the wedding will be in a meadow on a farm in England. 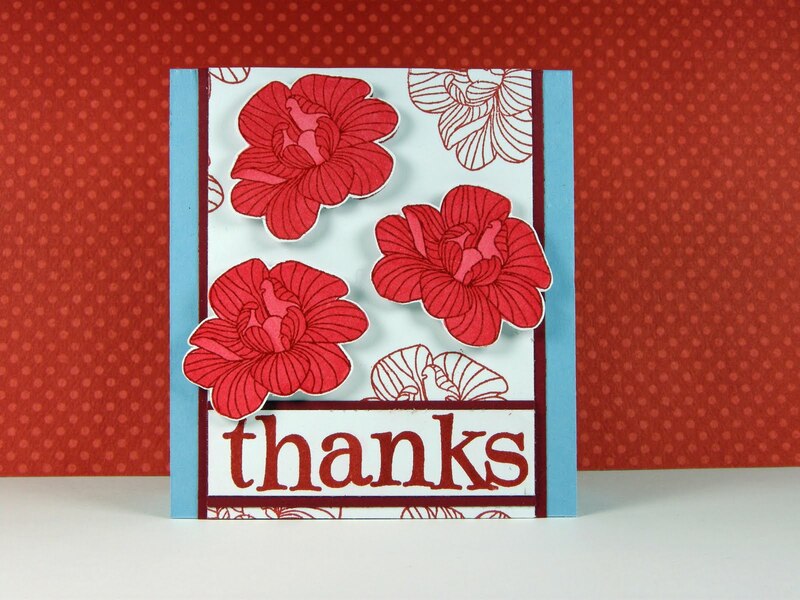 I used my PTI "Life" set for the flowers and Hero Arts "best wishes" for the sentiment. For inks I used CTMH colonial white & chocolate, Versamark aegean blue & umber. The ribbon is PTI. My second card is for our first wedding this summer in beautiful Zurich, Ontario though not Switzerland! Their invitations were made with handmade paper and were quite pretty. The wedding colours are orange & yellow, so I tried my best to keep that theme. The flowers are from a Hero Arts set and the sentiment is the same as the one above. The text at the bottom is from PTI's text style set. I used my Boweasy to make the bow because I'm not very good at making them look presentable! I hope everyone has a great weekend! Hopefully spring is now here to stay. My problem is (well one of many really!) that if I see a challenge I must do it. I guess the problem lies more in the fact that I willingly put off other things to do said challenge. 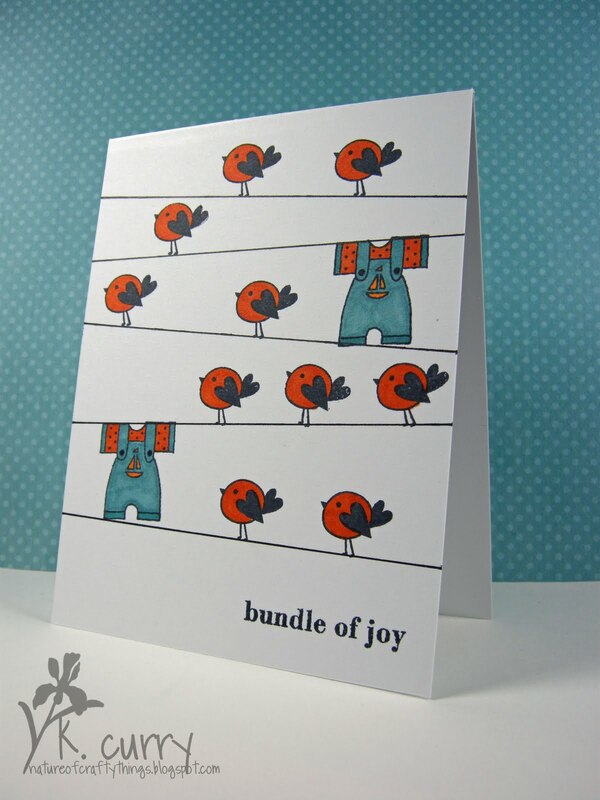 This one is another combined challenge, Lucy's challenge to use stitching, and the Cardvaarks challenge to make a baby card. The sentiment is also Hero Arts, the image is by Close To My Heart. I also wanted to use some felt and make another very clean & simple card, and this is what came out. I used a burgundy felt I bought at Michaels with my heart nestie die. 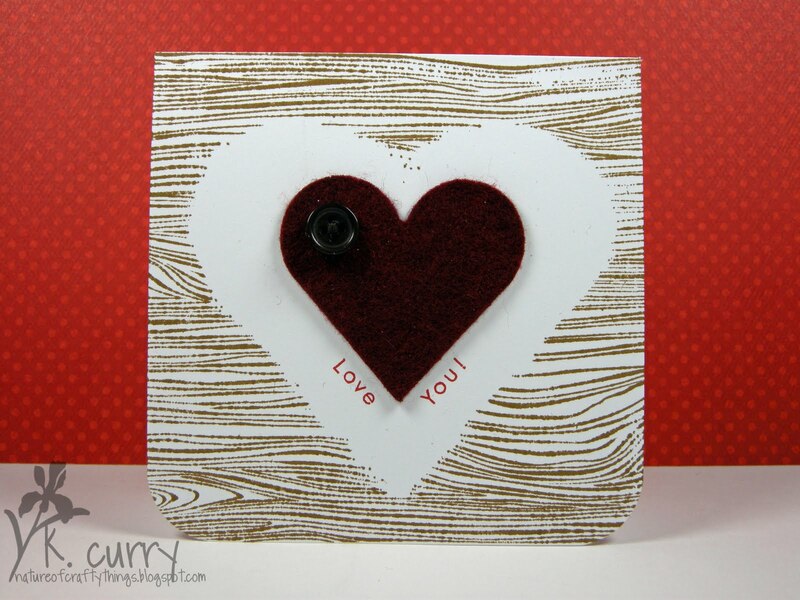 I also stamped a heart from a Hero Arts set and cut it out. Then I hand stitched around the felt heart. 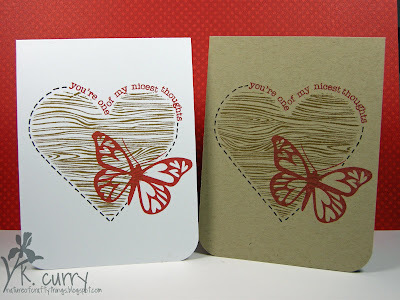 I stamped the sentiment also from 2 different HA sets, but I am not sold on it. 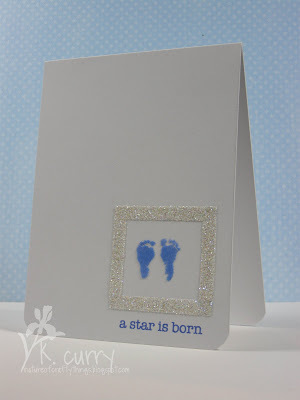 I think I actually liked the card better before I stamped it. Oh well. Thanks again for stopping by, I hope everyone has a good Thursday. 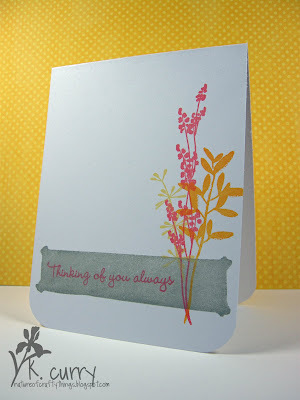 One layer, compose a card, color throw down! 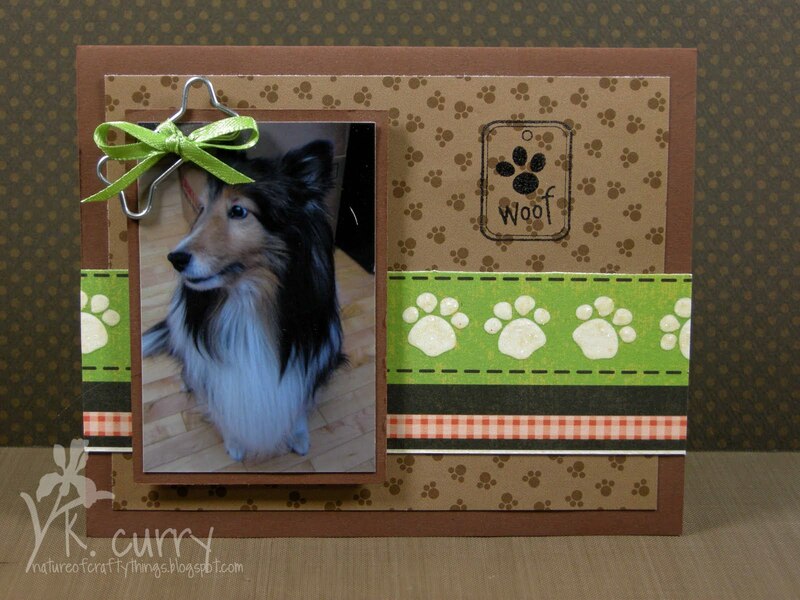 So i have been on a cardmaking frenzy lately!! 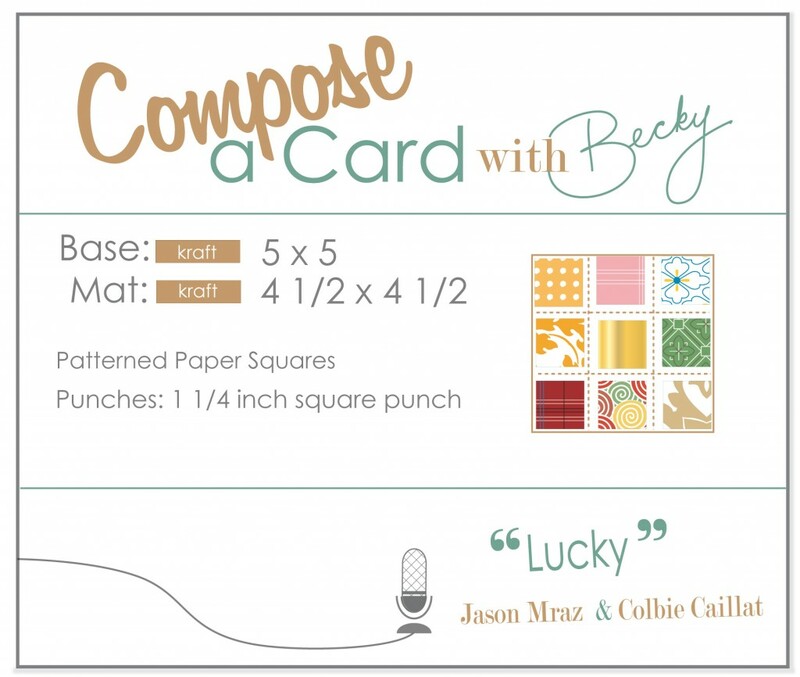 While looking through all things Papertrey Ink I came across Becky Oehlers' website (she has a new stamp set coming out with PTI this month!). 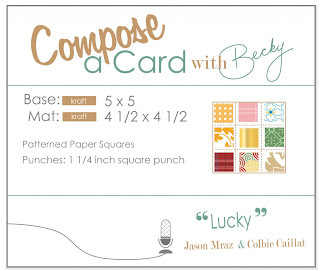 She also puts on a Compose-A-Card challenge. At the very top is my card for the challenge made using a transparency which is another step outside my comfort zone! I guess I sort of broke the rules! This card was made in response to Susan's one layer wednesday post. She always has the most amazing clean & simple cards. I just got the "Life" PTI stamp set and couldn't wait to use the images! To make the grey box at the bottom I used a frame set by Hero Arts, that I can't find the name of, and acutally used the back of the image to get the block not the frame. The colour combo is from Color Throwdown #88. My last card, for this post anyway was made for a co-wokers husband who is turning 50 this year. I wanted to do something bright and fun as that is the kind of couple they are! 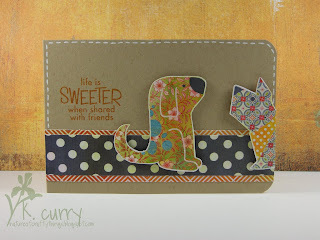 stamps: Hero Arts sending happy thoughts, whimsical numbers & a number 0 set I also can't find the name of! This is getting more addicting by the minute! Thanks for stopping by! Good morning! Well it's kinda morning for me, with the joys of shift work! Just a quick post & quick card before I'm off to work! 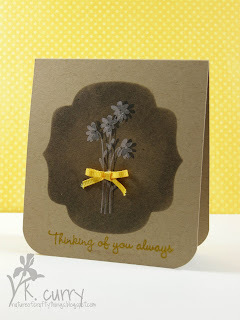 I used the negative cut image from the card I made yesterday to sponge the brown nestie shape. Then attempting to do the 3D thing as shown on Beate's blog, I stamped the flower image first in white, then in cocoa. Off to walk the puppy and cook lunch for work! Thanks for stopping by! OK last post then I swear to bed ;) I remembered that I needed to make a card for my MIL for mother's day. Surprised I'm early on this??? Yeah me too. 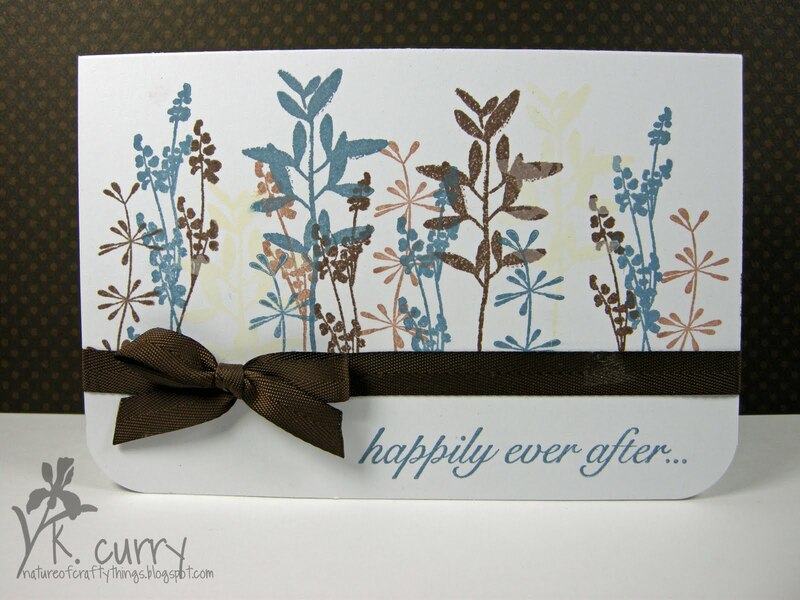 I have 2 wedding cards to make as well & I haven't even remotely started to think about them. 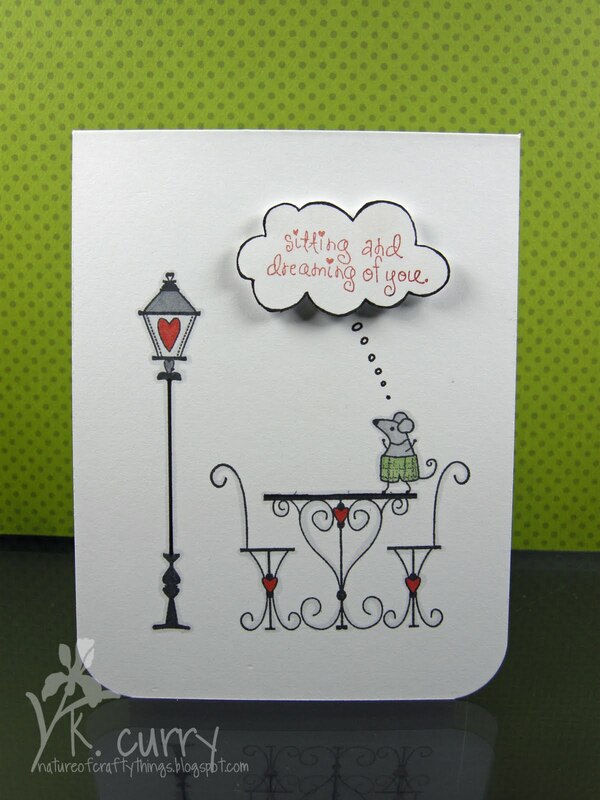 Anyway...here's the card based loosely on this weeks Sweet Sunday Sketch Challenge. I feel this card was a little out of my comfort zone, but hey, I gave it a shot! The flowers are paper-pieced from BG's Kioshi line. I promise they are not flat, and were tedious to cut out! 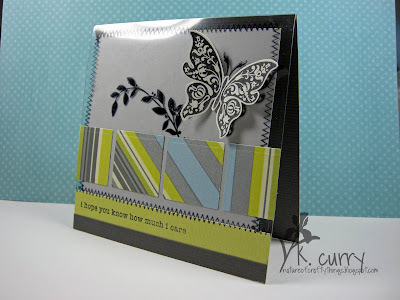 paper: Basic Grey kioshi, purple cardstock PTI? So, I was at the mall briefly today to get a non-slip towel for my yoga mat (loving hot yoga!) and of course I couldn't pass up the chance to get a chai latte on the way out. While I was waiting to pay I glanced down at the rack of gift cards and I saw this really pretty one with what looked like cherry blossoms on it. Immediately I thought to myself what a great colour combo! I also remembered noticing these great pictures taken by Dawn McVey. Here is the by-product of all that "noticing"! This card actually took a while to put together. I think I ripped apart and trimmed it a gazillion times! I hope it was a good weekend had by all! Thanks for looking! Really I should be used to this highly variable weather by now! So here is a Christmas holiday card....or two. This one was made using an old colorQ challenge from december of last year and this past weeks sketch from Moxie Fab World. They are celebrating the release of Go To Sketches. The challenge was to use the above sketch. 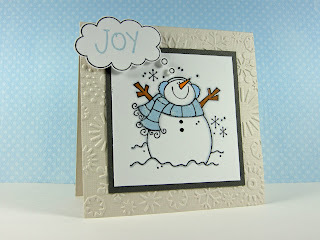 The snowman's scarf was paper-pieced from spring rain cardstock I stamped with a small snowflake from one of the Hero Arts sets. It's hard to see in the photo but if you click on it it's easier to see in the enlarged photo. other: cuttlebug snowflakes, pop dots. 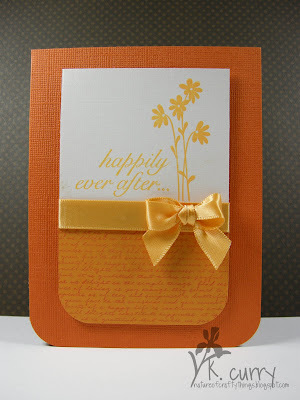 This card was made with the sweetest thing sketch in mind but I took a few liberties with it! 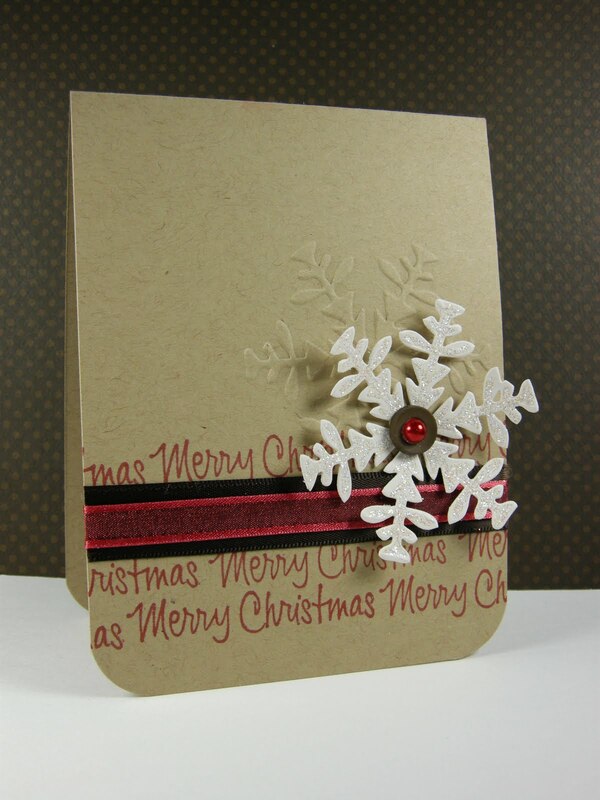 I punched out the snowflake with a cut emboss folder I had from cuttlebug and used the embossing folder directly on my card. I used a glue pen to draw on the snowflake cut-out and then sprinkled some glitter on it. Well I was on my way to bed and realized i had forgotten to email someone, so back down to the basement I go and type up my email. "let's have one more little peak on the internet" I thought to myself, "I'll only be a minute." Yeah right! I "quickly" jumped on to the Splitcoast Stampers galleries and found a challenge I apparently had to work on immediately. 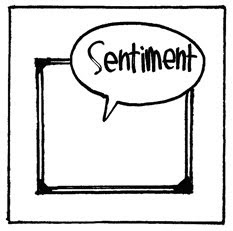 In one of my favourite areas, Clean & Simple cards, I found this sentiments challenge. The only stamping allowed is the sentiment. On top of my clear stamps was the Friends set by Hero Arts, and I saw this sentiment. I remembered I had cut these 2 dogs out of a scrap of Basic Grey paper I refused to throw out. Boy did they come in handy! How perfect are these two little friends! P.S. This also worked out for the Moxie Fab picking up the pieces challenge! Hello! Quick post today, made this card yesterday for a co-workers house warming. The patterned paper is basic grey, stamped image is from a unity stamp kit (hodge podge i think!) and the sentiment is Close To My Heart. I used this weeks Card Positioning Systems sketch #161, sponsered by hero arts this week! Image was coloured with copics. one layer easter tuesday trigger! Well this didn't really turn out quite as i planned but not too shabby! 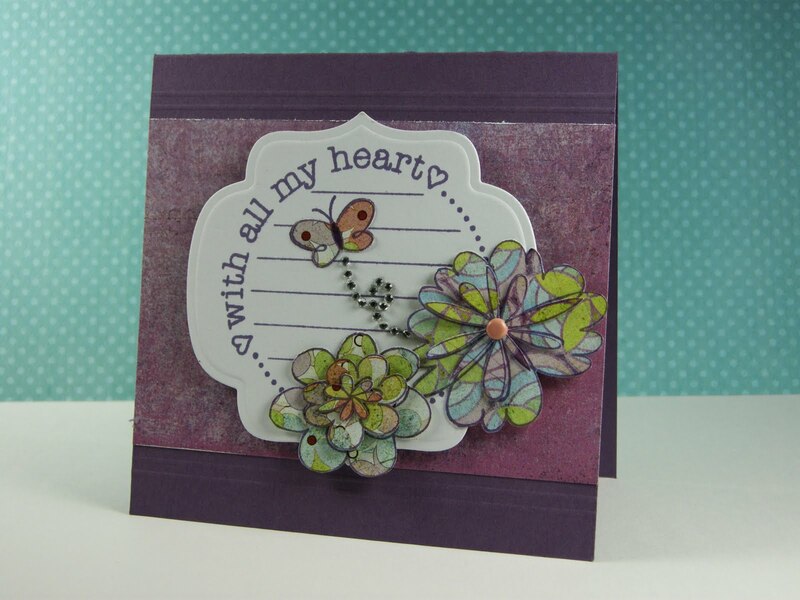 This card was made with the Tuesday Trigger from Moxie Fab World as inspiration. I am trying to challenge myself to one layer cards. I really like the way they look. The inks are also CTMH. This next card was inspired by this card. I picked the CTMH You've Got Flair simply because it looked fun to colour. When i saw the inspiration card, the Hero Arts stamps reminded me of this set that I had. So off I was to create another single layer card. I used scrap paper & removable adhesive to mask off a section then stamped away. The images are coloured with copics R32 R35 & R37, outlined in T1. Well...I couldn't wait to race home & make new card! Please tell me others feel this way too! Tell me I'm not alone. This one was made for the Card Positioning Systems sketch challenge #160. 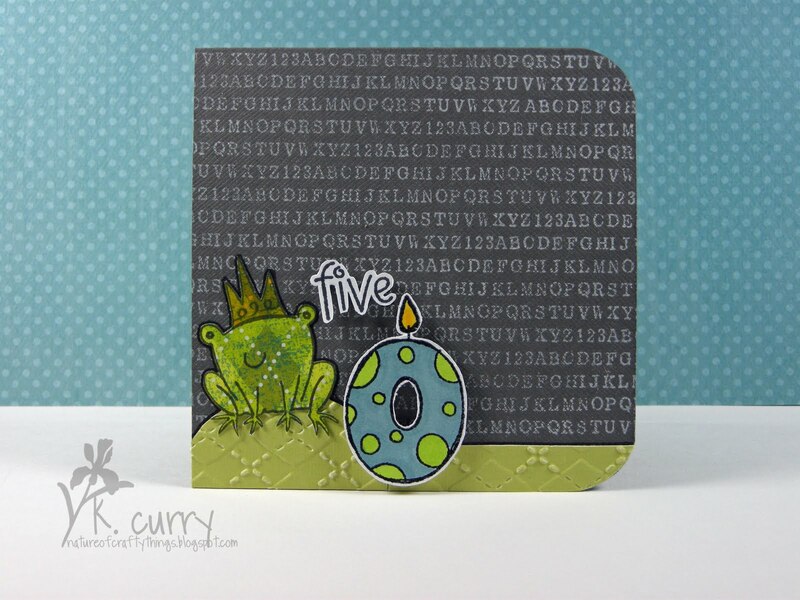 I used Papertrey Ink kraft cardstock, card measures 3 X 6, Hero Arts Hello Circles and All Occasion Messages. 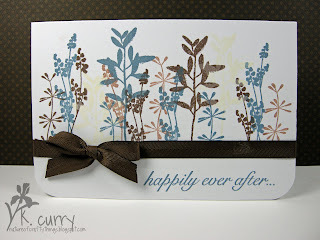 For the background strip I used Papertrey Ink's Text Style background stamp. Simple, simple, simple and super easy. I hardly ever have an idea set out in my head of a colour scheme or elements I want to use. I tend to pick the sketch then look through my stamps to see what speaks to me. Generally I have to pick 1 or 2 beacuse otherwise it would end up being a jumbled mess! I hope this easter weekend you get to some time with your loved ones. other: red pearls, EK success corner rounder, red grosgrain ribbon.